One of the only baseball blogs (to my knowledge) in the blogosphere that focuses on the Montreal Expos. Okay, mostly baseball in general, however with Montreal Expos references to be found within! One year since my last blog post! I wanted to write a new (proper) one tonight, but I did not give myself enough time, therefore I am writing this to hype the new (proper) blog post coming soon! I was actually following Dirk Hayhurst on Twitter before I was aware he had a book out. I was following him for the reason that he was a member of the Blue Jays organisation. And then at some point I saw he had replied to someone who had praised his book. Naturally, this piqued my interest, seeing as he is still an active player. Given the title, I was expecting more of an inside look into the game. For what it is worth though, it is that, and more. The book starts off with the end of the 2006 season. From there it quickly jumps to the following off season, and the not so glorious life that comes with being a minor leaguer. That being, training in a facility that is skimpy on heat, lighting, and Gatorade. And living with his grandmother. Living with his dysfunctional family is not really an option, as he fears being beat up by his drunken brother. Baseball of course to Dirk is an opportunity, an opportunity to hopefully provide a better life not only for himself, but his family. That being if he is able to make it to the big leagues. And at the very least work his way up the minor league levels. Although he can still use his baseball position to do well in the community. Life in the minor leagues is not easy. Pretty much nothing is handed to the players, and they have to earn their way up the ladder, or else catch a break if they get called up to replace an injured player. Dirk trying to go above and beyond a baseball player, and using his position for good is exemplified early on. He is working at a community centre that provides meals for the homeless and needy. His job is to pass the food tickets to people. He ends up having an exchange with a homeless man. He gives him his baseball card, only to see the man tear it up right in front of him. What use is a baseball card to a homeless man? Dirk went on to give his boots to the man, as his were soaked from the wet slushy weather outside. 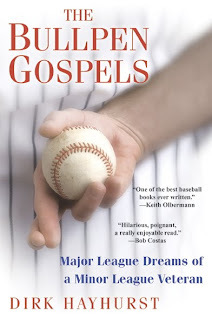 Although not in the book, as it chronicles his 2007 season, he went on to win the Community Player of the Year when pitching for the 2008 Portland Beavers (Triple-A affiliate of the San Diego Padres). During the 2007 season, he spent most of the season with the Double-A San Antonio Missions, prior to that though he started off with the Class A Advanced Lake Elsinore Storm. According to his stats he did play a couple games in Triple-A with the Portland Beavers, but that was not written about. It was mostly the ins and outs of minor league life, going from A Advanced to Double-A, along with the pros and cons. Mostly being cons. Prior to the 2007 season, Dirk explains how he had thought of quitting baseball, but in the end returns, hoping for greener pastures (MLB playing time), and also it gets him away from his family (who he loves, but it is not exactly the best family scenario). So generally, getting the less glorious tale of minor league ball, all the while still getting baseball insights (pre-game rituals, food and living situations, fans begging for balls, the different stadiums and setups, etc. Good stuff for baseball geeks like me.) makes for a quality read. And with the baseball off season upon us, no better time to pick it up! Also, check Dirk out at his website, or his Twitter feed. Okay, maybe not exactly mlb.com, but close enough! I am on the photo page for the April 14 Jays game against the White Sox. Apparently that game was a record low for attendance at a Jays game in SkyDome (I still call it that, not Rogers Centre!). The announced attendance was 10,610, however it felt more like an Expos game when they were in their lame duck years. Based on memory, I'd say no more than 8000. Without further ado, the image, and url still there, so you can (probably not bother) see for yourselves! I'm in about the sixth row with a red hat (follow Brandon Morrow's glove through the umpire's head). And yes, I got a couple of foul balls, and gave one away. I saw this episode when it aired, last Sunday, October 10, and thorougly enjoyed it. It just dawned on me, that I could post a review here, as I am in dire need of posts on this (very much still alive) blog. The Simpsons being my favourite all time show, even if I do not watch it very often anymore, save for new episodes when I have the chance. So of course, The Simpsons has countless baseball references, most notable being the 1992 episode dedicated entirely to baseball. That episode was "Homer at the Bat", where numerous big leaguers had sizable guest spots. That was the episode where Mr. Burns hired all the ringers to work in the power plant in order to be eligible to compete on their softball team. This was to ensure Springfield Nuclear Power Plant's softball team would beat Shelbyville's. This past Sunday's episode was also entirely dedicated to baseball. The title, of course a reference to the Michael M. Lewis book, Moneyball. Oh, and if per chance you have not seen it, there are partial spoilers within. The show starts off with two plot lines that become one in act two. Lisa becomes worried she will not be able to get to an Ivy League school due to her minimal involvement in school clubs. Meanwhile, Ned Flander's resigns as Bart's baseball teams manager. Reason being, Ned let the umpire call a long fall ball a home run run without saying a word, this of course was his own shortstop! A Montreal reference worth noting, Marge tells Lisa she could always go to McGill (the Harvard of Canada)! So of course Lisa becomes the new manager, much to Bart's initial shagrin. Lisa, not knowing baseball heads to Moe's Tavern, to find the drunks watching baseball, and ask them about baseball. All they know is whatever the manager does, he is it wrong, and if it works, he is a button pusher! Lisa then finds Professor Frink and the other nerds talking baseball, sabermetrics style! Bill James (the one who coined Sabermetrics) guests with the funny: "I Made baseball as much fun as doing your taxes!" One of the books the nerds give her is of course Moneyball. She continues to bone up on baseball. With her Moneyball, and sabermetrics research Ralph Wiggum ends up being positioned peferctly to catch a line drive. The show then goes into a montage featuring of course "Take Me Out to the Ballgame" as background music that shows her team moving up in the standings. After which, a good Nelson Muntz soundbyte. And Bart naming ballparks, Enron Field (ha ha! ), Pacific Bell Park, then SBC Park, and now AT&T Park. As the show progresses, there's numerous good quotes and Simpsons style wit, such as the announcer saying "Bart Simpson on deck, his bat's just hungering for a homer... speaking of homer, Bart's father's name is you guessed it, not on my fact sheet!" 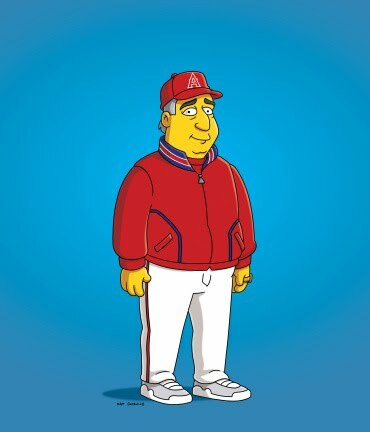 Also nice is the Mike Scioscia cameo. He of course was in the 1992 Simpsons episode, so it made reference to that. He was the one who got radiation poisoning, which Scioscia explains helped give him super managing power. Perhaps a hidden gag on the length of a ballgame, with Bart off the team, he states how after seven hours at the amusement park he is finally starting to enjoy himself. All the while, this is while Lisa's baseball game is going on. Ralph is later then too juiced to play, juiced as in too many juice boxes! He did not know what he was putting into the body! The episode ends of course with everything being back to normal as per usual. As referenced in C.E. D'oh, which also ends with bart saying he is Tomokazu Ohka of the Montreal Expos! While Milhouse is Esteban Yan of the Tampa Bay Devil Rays. I have omitted many good quotes, definitely worth seeing for baseball fans, especially baseball fans that like The Simpsons! Anyway, on with the player, and prospect blogs. Earlier this month, I mentioned on Twitter how Michael Barrett was signed to a minor league contract by the New York Mets. In the article linked from the Twitter post, it said how we was expected to move up to Triple-A Buffalo after a few weeks. Well now he has. He played 15 games for the High-A Mets affiliate, St. Lucie Mets. In those 15 games, he batted .220, in 50 AB. His OBP was .278. In two games for the Buffalo Bisons, he is so far 0 for 6. Presently catching for the Mets is Henry Blanco and Josh Thole. Rod Barajas is on the 15 day DL with a strained left oblique. Omir Santos who is on the Mets 40 man roster despite playing currently with the Double-A Binghampton Mets. He has not played for the Mets since last year. With all that in mind, perhaps Michael will be back in the Bigs in the near future. I met him in the off season, at a sports journalism panel, so it would be nice to see him playing for the big club. A few days ago, former Expos closer, Chad Cordero signed a minor league contract with the Mets, on July 22. He was re-signed by the Mariners late last year (December 28). So to this point in 2010, he played in 17 games for the Tacoma Rainiers (Seattle Mariners Triple-A affiliate), and moved up to the big club June 3 (Contract purchased from Tacoma (AAA)). Chad Cordero played nine games with Seattle, his first in the Bigs since being with Washington in 2008. July 15, he "refused option to Tacoma (AAA) and became a free agent". Hence now signing with the Mets, and has been assigned to the Buffalo Bisons. So a couple of former Expos team mates will probably form a battery shortly with the Bisons. He is still playing out of the bullpen. Speaking of former Expos, Valentino Pascucci is also currently with the Buffalo Bisons (on the 7-day DL at the moment). He only played 32 games with Montreal, starting 17 (2 at 1B, and 15 in OF). He not not played in the majors since. In January 2009, he signed a minor league deal with the Dodgers (61 GP with the AAA Albuquerque Isotopes, batting .211), then in June 2009, a minor league deal with the Padres (65 GP with the AAA Portland Beavers batting .277), and finally in February of this year a minor league deal with the Mets, so far appearing in 46 games, batting .238. He has been playing the outfield. Primarily in right it would seem. Andre Dawson was about halfway through his time with the Expos when I was just being born in 1980. Point being, he was playing long before I started following baseball as much as I do now. However from what I have learned, and what his peers have said, he is more than a eligible to find his way into the Hall. Even though by edict of the Hall he'll be the second player -- following Gary Carter -- to enter wearing a Montreal Expos cap. It seems he wanted to wear a Cubs hat, but the Hall makes the decision, and chose Expos. I feel that is the correct call, as an Expos fan, and baseball fan. If he started off for 10 years in Chicago, then he should wear the Cubs hat. Baseball Hall of Fame Andre Dawson holding his jersey pictured now. I was in Quebec City at the time. Away from most modern technology we take for granted today. Television was accessible at the time. I was able to see some of the Boston Philadelphia game. I noticed Big Papi David Ortiz had a RIP José on his hat. José Lima was the only person I could think of, but thought he was too young. I later found out it was indeed him. I did not know him personally, however as batting practise is part of my religion, I caught the Royals in Toronto in 2005, when he was with the Royals. Since pitchers in the American League do not have to worry about hitting, I imagine they rarely take batting practise, so they hang out in the outfield. José Lima was among those in the outfield at the time. He was goofing around with fans, in other words very fan friendly. Some fan dropped his sunglasses onto the playing field, and José retrieved them, being the fun guy he is, he tried them on. I'm sure the fan must have got them back eventually. Anyway, just from that it was easy to tell he would be a well liked guy. Of course anyone that follows baseball enough to know him, knows he is that kind of guy. So it's too bad to see him go. Baseball lost a good guy. * denotes blog no longer being updated.